Recently, I wrote CamDesk which can display webcam stream as a widget on the desktop. Today, I'd like to write about an application which can turn your webcam into nice photobooth. Introducing Cheese! Cheese is a program for the GNOME Desktop which allows you to take photos, videos, and anything else you can think of with your webcam. Just start it up and shoot! Gather all of your friends around, have some fun! When you're done, share your photos and videos with 'em! Supports count-down so you can put on your eye make up or fix your hair before the photo is taken. Cheese has many ready-to-use effects. Morph yourself into Hulk or a nice pink alien, or even pile up effects in order to obtain the most amazing results! Burst mode. Take many photos at once! Ability to record video and apply effects to it. Optimized for small screen computer (netbook). Support multiple webcams. You can switch between them with single click. 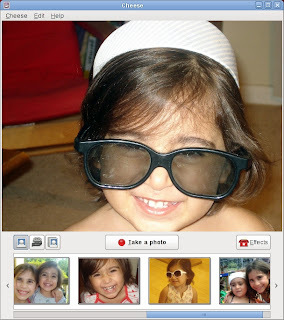 Easy sharing to Flickr, email or make as GNOME account avatar. Open the app and cheeeese!